We have the pleasure of inviting to three exhibitions related to this year’s jubilees associated with Polish–Egyptian cooperation. The events are co-organized by the Department of the Archaeology of Egypt and Nubia (Institute of Archaeology, University of Warsaw), the Polish Centre of Mediterranean Archaeology, University of Warsaw, the University of Warsaw Museum and the Herhor Association. Two of the exhibitions will be held in the Old Library of the University of Warsaw (Krakowskie Przedmieście 26/28). 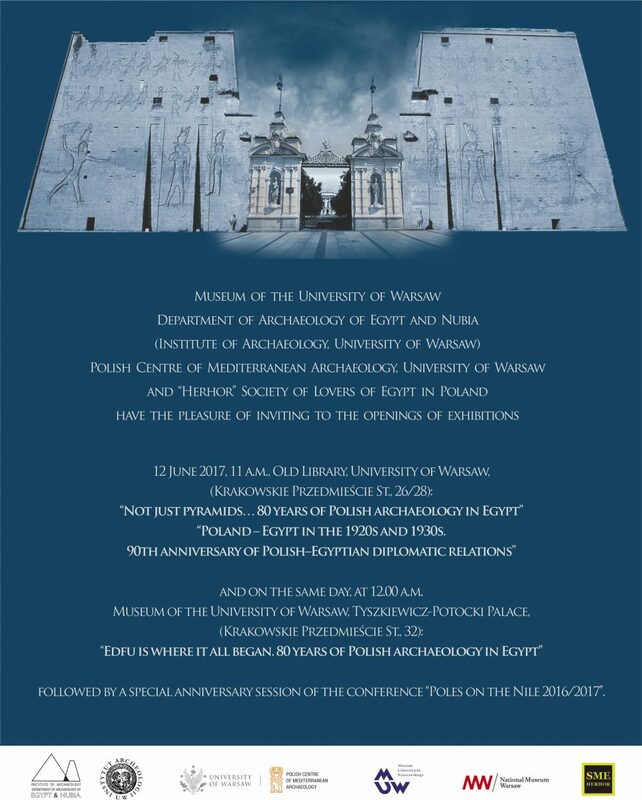 “Not just pyramids… 80 years of Polish archaeological research in Egypt” will present an overview of eight decades of Polish archaeological research in Egypt. Much of that work was undertaken under the auspices of the Polish Centre of Mediterranean Archaeology, University of Warsaw. “Poland – Egypt in the 1920s and 1930s. 90th anniversary of Polish–Egyptian diplomatic relations” will highlight the beginnings of diplomatic ties between the two countries. A separate exhibition in the University of Warsaw Museum will focus on the 80th anniversary of the first Polish archaeological excavation in Egypt, that is, the French–Polish project that Professor Kazimierz Michałowski directed in Edfu. “Edfu was where it all began… 80 years of Polish archaeology in Egypt” will showcase some original artifacts from the University of Warsaw collection deposited at the National Museum in Warsaw. These events will accompany the annual archaeological conference “Poles on the Nile”. Opening: 12 June 2017, 11 a.m. Opening: 12 June 2017, 12 a.m.